For those for whom black-grass is an increasing problem, cultural controls – particularly delayed drilling, seedbed quality and seed rates – are the first priority, followed by the right combination of pre- and peri-emergence herbicides, says independent agronomist Jonathan Olver. Getting black-grass control measures right in the autumn and winter is critical. Trying to tackle black-grass in spring is a case of ‘too little, too late’, believes DuPont herbicide product manager Alister McRobbie. His view is shared by Jonathan Olver, an independent agronomist and a member of the Association of Independent Crop Consultants. He works with some 25 clients in Gloucestershire and north Wiltshire advising on combinable crops as well as forage maize, fodder beet and grassland. He says: “I have been working in this area for 30 years, and over that time black-grass has become a worsening problem. Thirty years ago, around 25% of my clients had no black-grass on their farms, now there is only one farm free of the problem. On some farms, due to previous cropping, there is land – perhaps around 10% - which doesn’t have any black-grass, although it is still present on other parts of the farm. The level of black-grass infestation overall varies from low to very severe. “It has certainly become more of an issue over the last 20 years with the loss of several key herbicides, and also the use of some husbandry practices which have perhaps done more harm than good, for example the trend to early drill winter wheat and low seed rates in the late 1990s. Unlike some agronomists Mr Olver still finds that in many situations post-emergence contact herbicides such as Pacifica (mesosulfuron + iodosulfuron) are delivering high levels of black-grass control. In some cases this is close to 100%, but even where it falls away to 60%, these herbicides still have a role. However, for Mr Olver, getting the right cultural techniques in place is critical before even starting to consider the application of herbicides. 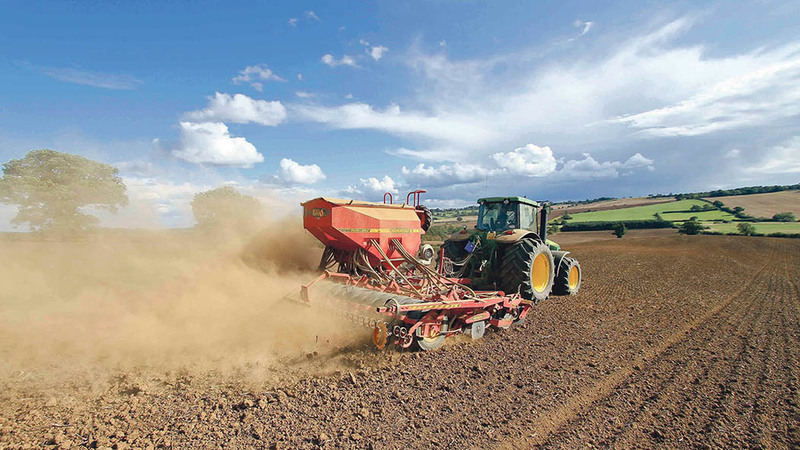 For winter wheat these begin with delaying drilling, certainly to the beginning of October for fields with low levels of black-grass and definitely until late October for the worse fields. This allows time to create stale seedbeds and spray off with glyphosate. The next stage is to create the best possible seedbed for pre-emergence herbicides to work. Getting his clients to understand how critical seedbed quality is has prompted Mr Olver to provide his clients with photographs of what a top-quality seedbed needs to looks like. “If I was to score seedbeds from one to 10, only nine or 10 would be good enough,” he says. “This is based on aggregate size, consolidation and soil moisture, etc. I am well aware the weather and soil type has a lot to do with this, but unless you get it right you will end up with unsatisfactory weed control. “One way of doing that is through direct drilling, where the soil is not disturbed at all. If you churn the soil up to a depth of, say, five inches and produce a knobbly seedbed, you have almost certainly lost control of black-grass even before you start. The next stage, and one Mr Olver considers to be the most significant cultural control technique against black-grass, is to achieve highly competitive crops. This can be done by using seed rates of anything up to 500+ seeds per square metre for winter wheat. While some of Mr Olver’s clients may consider this to be difficult or expensive, he points out it is less expensive than failing to control black-grass. He also says with GPS tracking it is possible to map the areas of the field where black-grass is less severe and drop seed rate to a more normal level. As well as increasing seed rates, certain varieties of wheat can provide greater competitiveness with black-grass. Mr McRobbie echoes Mr Olver in the call to prioritise cultural controls. During his career with DuPont he has spent time managing trials, as well as working as regional technical manager for the east of England. Crop rotation is also an important factor for Mr Olver and he believes growers should introduce, wherever possible, those crops which offer the highest levels of black-grass control into their rotation. This is the final article in a series of three which looked at evidence of the spread of black-grass outside traditional areas in the east of England, and how farmers seeing black-grass for the first time could respond. When it comes to application of herbicides, Mr Olver uses a scoring system depending on the amount of black-grass in the field, to allow a suitable strategy to be developed on a field-by-field basis. A score of ‘0’ is a field with no black-grass; ‘1’ means you have had good black-grass control with no significant seed return for the past three years; ‘2’ means you have had some seed return in the past two years; and ‘3’ means poor control and significant seed return in the previous season. Depending on how the field scores will determine the robustness of the herbicide treatment and the overall cost involved. Mr Olver recommends applying a pre-emergence treatment within 48 hours of drilling in all situations. For a more robust programme, he would use a combination of one-litre/ hectare Movon (flufenacet+ diflufenican + flurtamone), in tank-mix with three litres/ha Defy (prosulfocarb). He also advocates the use of an additive – BackRow, which helps with the distribution of the herbicides in the soil surface and may also help to protect the crop shoot during germination. He says it is critical to get application techniques such as nozzle selection for spray quality, boom height and forward speed absolutely spot-on. Mr McRobbie also believes a robust pre-emergence regime based on flufenacet is essential and advocates the use of Lexus (flupyrsulfuron-methyl) and other AI’s as part of the tank-mix. Both men agree the next stage is to apply a treatment as the plant emerges – peri-emergence. Mr Olver recommends the application of 0.5 litres/ha Pontos (flufenacet + picolinafen) at this stage. Mr Olver suggests, where its efficacy is still proven, using a further application such as Pacifica or Monolith (mesosulfuron + propoxycarbazone) in spring to mop up any remaining blackgrass, Mr McRobbie’s view is that this may be too late. “If you haven’t controlled black-grass by spring, it is probably too late, especially given the fact the main product used in this period is now experiencing widespread resistance,” he says.